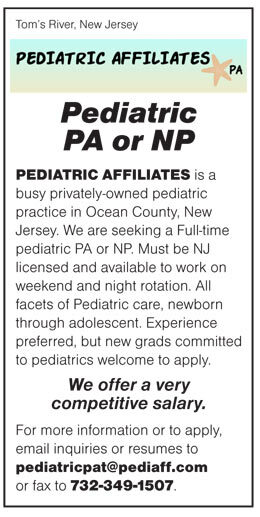 PEDIATRIC AFFILIATES is a busy privately-owned pediatric practice in Ocean County, New Jersey. We are seeking a Full-time pediatric PA or NP. Must be NJ licensed and available to work on weekend and night rotation. All facets of Pediatric care, newborn through adolescent. Experience preferred, but new grads committed to pediatrics welcome to apply. We offer a very competitive salary.